I love a good war movie.Â Saving Private Ryan is one of my all-time favorites, even though itâ€™s mainly hilarious to see Vin Diesel in it.Â The true gold standard of wartime entertainment stands with HBOâ€™s masterpiece miniseries event, Band Of Brothers.Â From training camp to Germany after the war, this journey of a group of soldiers is one of the greatest things ever shown on television.Â Now another film which hopes to follow in that vein has arrived on DVD. Starting this February 10th, now available on DVD from Touchstone Home Entertainment and Forty Acres And A Mule Filmworks comes the latest Spike Lee joint.Â Miracle At St. Anna is ready to fight itâ€™s way out of your television screen and bring you a story of identity and struggle and survival based off of the novel by James McBride.Â Bring home this World War II film today! The US Armyâ€™s all-black 92nd Infantry Division, known as the Buffalo Soldiers, are stationed just outside of Tuscany, Italy during the second World War.Â Their white officers have little trust in their soldiers and even less understanding of whatâ€™s really going on.Â Four black soldiers are trapped behind enemy lines while their comrades retreat.Â They have to find a way to survive and save a young Italian boy from dying.Â Now they have hooked up with partisan Italian fighters and are making a stand to save a village.Â This film stars Derek Luke, Michael Ealy, Laz Alonso, Omar Benson Miller, John Turturro, Joseph Gordon-Levitt, John Leguizamo, Kerry Washington and D.B. Sweeney. The special features included in this DVD are Dolby Digital Surround Sound, Spanish and French Language Tracks and a widescreen version of this film. I cannot express just how disappointed I was in this movie.Â My roommates had both seen it before I had and they said it was terrible, but I like Spike Lee movies.Â Not just his most recent, very popular one, but the earlier and more obscure ones.Â I was highly excited to see this film because it was about war and it was by Spike Lee.Â I had high hopes and they were completely dashed by this movie.Â The beginning was incredible and shockingly so.Â The camera angles, the way the story was told, the shooting at the post office, all of this made me more and more excited that this movie would blow me away.Â Then we go back in time and the movie gets terrible.Â There is stilted dialogue, two-dimensional characters, a noticeable lack of plot and forward direction.Â I wanted so greatly for this to be Spike Leeâ€™s true masterpiece and it ended up as a failure.Â This is a loss for all of us. If you can sit through this movie, itâ€™s nothing short of a Miracle. 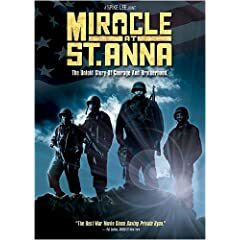 2 users commented in " Movie Review: Miracle At St. Anna "
I enjoyed this movie on many levels, but still can’t figure out who the person was who was shot in the very beginning of the movie by the postal worker? It’s driving me crazy! Anyone care to comment?? The guy that was shot in the post office, was the italian soldier who caused the murder of the the towns people in the small village in Italy during the war. He was the one that killed the Italian leader of the rebels and the little boy in the story knew he was the one that caused the murdered people. See the movie again and you will see.